When I hit 40 it makes me more keen about skincare and it's array of brands. Are you? Maintenance is becoming more and more luxury to think and consider and I can't even remember when is the last time I ever bought a bag or shop for a wardrobe than I often do with skincare and cosmetics nowadays. To some who personally know me, and for a long time reader might know that I don't easily try products that I don't often use or don't believe in, just for the sake of trying. I'm hesitant to do that so whenever I use skincare it only means that they get my full trust and really want to try the product. As always, I have my favorites that I repurchase over the years and some I tried and love, but breaks my heart that it gives me a hard time to repurchase. But a tested product like those can't be forgotten and when opportunity comes, I will do the click with all of my fingers. Ha! Did you ever experience curiosity over the product and did not even hesitate to purchase and try? Well, I did! 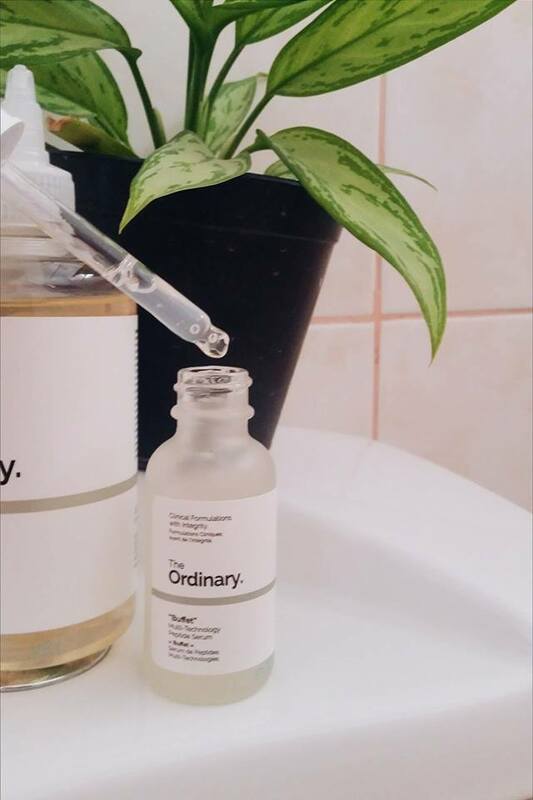 And that happens to me with the new brand THE ORDINARY. At first I'm hooked with the vintage drug store like packaging. Next is the pricing. Just think of it, how come the products can afford to deal with low price and can do good for your skin? 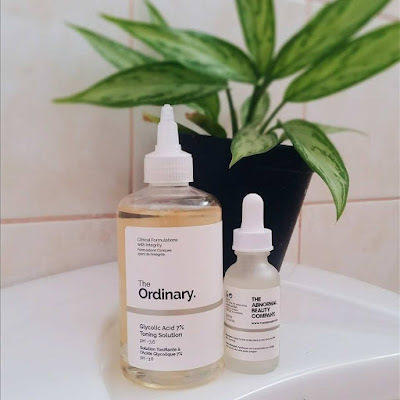 For the suggested retail price that cut almost half to three-fourth percent of the good skincare brand in the market, I'm curious to know what this brand can offer. Then I checked all the items and found out so many things that's in my bucket list. And to top it all, for a lady who manage to use high and low brands to suit her budget, I love to try their product and if the result is satisfying, I can add it to the rotation of my skincare routine. I do a rotation once in a while. 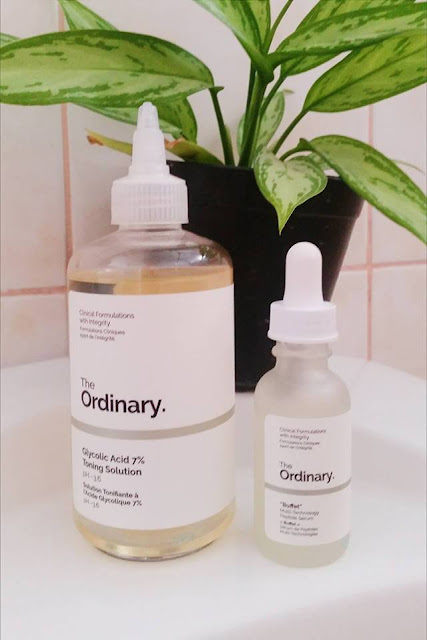 So my concern is about firming and lifting so the Buffet Peptide Serum is my choice and my toner is running low that time so instead of thinking of getting the vitamin C for prevention of further pigmentation and to helps brighten the skin, I skip it first and get the Glycolic Acid 7% Toning Solution. I'm thinking of getting the Vitamin C next if saw improvements AFTER using these two. So with no hesitation, I ordered. Glycolic Acid 7% Toning Solution - It is often use to treat skin discoloration, signs of aging like fine lines and wrinkles. If you also suffered from dull skin glycolic is a good addition to the skincare regimen. I often use to ask the aesthetician about this when I undergo a once in a while glycolic facial peel so the moment I saw the toner version I become interested. 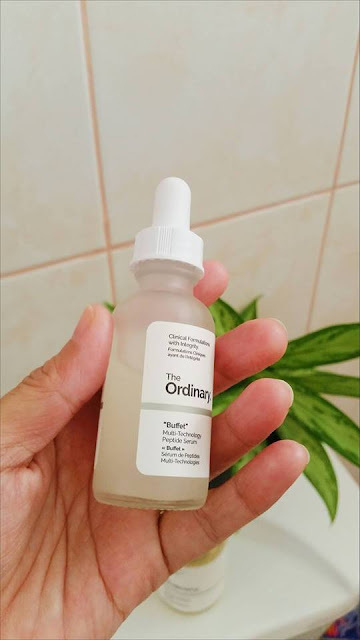 I only use it at night as prescribed with 2-3 drops on cotton balls and wipe it all over my face in upward motion including neck and decollete, skipping the eye contour area. In the morning as I wake up I wash my face and go with my morning routine to avoid any skin pigmentation since glycolic has an alpha hydroxy acid AHA that is sensitive to sun exposure. To avoid sun damage be sure to top sunblock after your morning face routine. As three days short of time I notice changes in my skin tone and to say this is the first time I ever use a toner that gives such result. It did brighten and even out my skin tone as days goes by, but the color of my skin becomes a pale yellow than the usual that I need to check my face near the mirror to get a closer look. Some of greenish veins also appear after wiping it on but easily disappear as I finish my skincare steps. I really don't know what is the theory behind it, if it really makes your undertone to appear more. I am an Asian with yellow undertone. 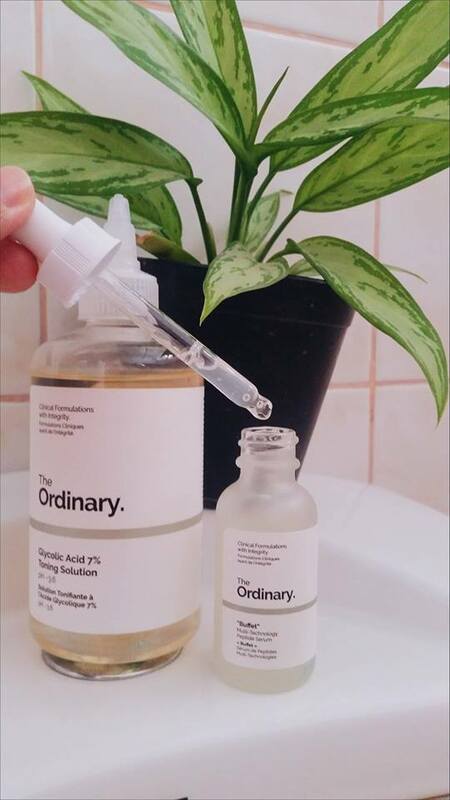 Does any of you uses Glycolic toner and have the same observation? Does it also makes your undertone to appear? Or did you notice you become pale after applying too? Will love to know your experience. Aside from that luckily, I did not have any break outs while using the product with my combination skin. I did notice a slight peeling on my chin and jaw too for a couple of days but I know it's normal since glycolic helps renew the skin and it's not noticeable at all. It also hydrates and does not make my face to feel tight or dry. It's unscented too a plus to those who are sensitive to intense fragrance. Buffet Multi Technology Peptide Serum - is a water base solution. It is advice to apply before moisturizer in the morning and at night as prescribed. According to the description, it's an all in one anti aging remedy that is why it's called Buffet. For days but not exceeding a week I follow the instruction and saw maximum result. It does gives your face a firming effect but find the serum too strong for me that gives a tight feeling for my days of continued use. But I continue the application still since I wanted to see how it goes within weeks of application. So I adjust the usage from twice to once a day with alternate use in the morning or in the evening. However, I find it too oily to use in the morning underneath make up and giving me a greasy look feeling that's why I opted to use it only at night. Maybe living in a hot humid climate cause it on me. But whenever the weather is bearable I apply the serum in the morning to follow daily use and for optimum result. It's been three weeks now and all I can say is I am pleased with the result on me. It firms hydrates, tightens and smoothen the skin and most of all I saw a big improvement on my face contour. I use one-fourth solution in the droplet, if you find it helpful. You can adjust the consumption base on your current skincare concern as per my personal experience, to see the result that you wanted. This is definitely a serum to use if you are after lifting and hydrating effect. Buffet Peptide Serum without a doubt will be replenish in my beauty arsenal. A must have!